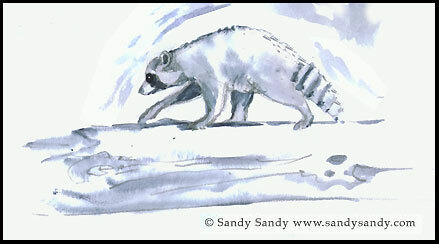 *SANDY SANDY ART*: Snowflake the Mother Raccoon is Alive! 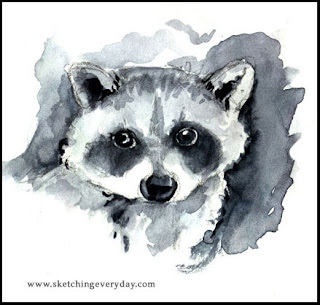 About eight to ten years ago, Snowflake the raccoon came into our lives. She was out in broad daylight, up in a tree on the edge of the yard. Jerry thought she was sick, but I knew she wasn't. Just looking at her, you could tell she was the picture of health. She most likely had young ones to feed and was out scouting around for a meal. 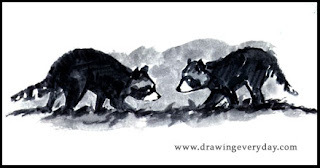 A couple of weeks ago, we sadly found a dead momma raccoon on the side of the road, by our driveway. Not wishing to think that it was our own long time resident, Snowflake, we kept hoping for a glimpse of her. She had moved this years' litter out from under the hay shed several weeks ago. We hadn't seen her and the three babies since. Jerry was working in the yard today when he saw a raccoon out around noon. He called her name several times and each time she paused and looked up, obviously unafraid. We are certain it was her. She is the only raccoon we ever saw out in the middle of the day here. YAY Snowflake! We are both relieved and happy. I love this story with a happy ending.